November 25: Big Brothers Burger for P97.50 only. November 26 to 30: Big Brothers Burger with Soda in Can for P99 only. 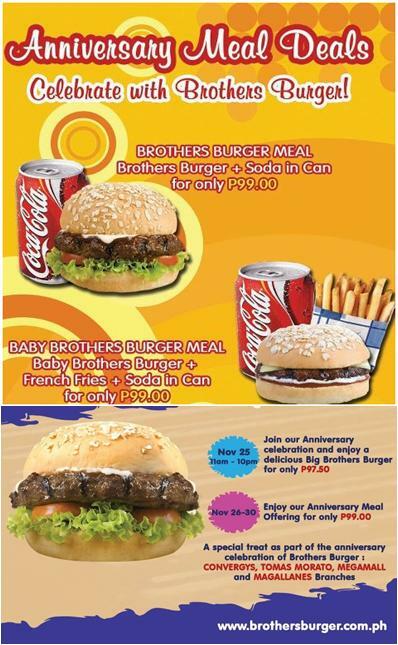 November 26 to 30: Baby Brothers Burger with Fries and Soda in Can for P99 only. Happening only at the following branches: Convergys Makati, Tomas Morato, SM Megamall and Magallanes. What's up, all is going nicely here and ofcourse every one is sharing information, that's really excellent, keep up writing.